Jesus said to him, "Have I been with you so long, and yet you have not known Me, Philip? He who has seen Me has seen the Father; so how can you say, 'Show us the Father'? (John 14:9) And without controversy great is the mystery of godliness: God was manifested in the flesh, justified in the Spirit, seen by angels, preached among the Gentiles, believed on in the world, received up in glory. (1 Timothy 3:16) and whatever we saw Jesus do; was the will of the Father God. In Acts 10:38 the Bible makes it very clear that it is God's will to heal all that are oppressed by the devil with sickness. How God anointed Jesus with the Holy Ghost and with power who went about doing good and healing all that were oppressed of the devil; for God was with him. Saints, it is the will of God that His people are healed. As long as the devil can use people to fool them into thinking God is bringing sickness on them, they will never resist the devil and believe for God to heal them because they think God is punishing them for something they did or did not do. The sad part is that you will have people in the church saying to the sick person, and others that God is trying to teach them something. If God has something to teach you He does not have to make you sick so that you can learn. Our God is a God of love - merciful and compassionate. James 1:17 Every good gift and every perfect gift is from above, and comes down from the Father of lights, with whom there is no variation or shadow of turning. The Bible says every good and perfect gift comes down from the Father of Light. Sickness cannot be a gift God sent down from heaven, because it is not good and there is no sickness in heaven. Also, sickness cannot be a good and perfect gift. The Bible says in Acts 10:38 "how God anointed Jesus of Nazareth with the Holy Spirit and with power, who went about doing good and healing all who were oppressed by the devil, for God was with Him. God anointed Jesus of Nazareth who went about doing good—healing all who were sick and oppressed by the devil. People who are unacquainted with the Word often do not realize that ever since the fall of man there has been a curse on the earth. Because they do not understand that they live in a fallen world, where the devil dominates. They accuse God of causing accidents that take place, they accuse Him of sickness and death of loved one's and they accuse Him of storms, earthquakes and floods. Even insurance policies state catastrophes as 'acts of God.' The devil is a liar. We (Believer's) know that the devil is the god of this world that causes these things. 2 Corinthians 4:4 "whose minds the god of this age has blinded, who do not believe, lest the light of the gospel of the glory of Christ, who is the image of God, should shine on them." However, in John 10:10 "The thief does not come except to steal, and to kill, and to destroy. I have come that they may have life, and that they may have it more abundantly. Jesus makes it clear what the devil comes to do. The devil is a thief and he comes to steal, kill and destroy. Anything that steals, kills and destroys is from the devil. Jesus comes (bless God) I thank God I can read, so that we could have life and more abundantly. Abundant life is not lying in your bed sick and broke. John 14:10 "Do you not believe that I am in the Father, and the Father in Me? The words that I speak to you I do not speak on My own authority; but the Father who dwells in Me does the works." If I want to see the words of God— look at Jesus, He is our example to know what God is like, In Hebrews 1:3 the Bible tells us that Jesus is the expressed image of God, so if we want to know how God feels about sickness and disease look at Jesus' life on earth. He was always healing people every chance He got. All through the ministry of Jesus He always did God's Will. He came down to do God's Will not His own. (John 6:38). So again, if we want to know God's Will for a situation, just look at what Jesus did and we will know what God will do. Saints, we must understand that the ministry of Jesus consist of teaching, preaching and healing. That was and that is what the ministry of Christ Jesus is all about! Every city and village He entered He did the same thing (Matthew 9:35) so that means healing is ordained by God. 2) Jesus is the word. John 1:1,14 says The Word (Jesus) was made flesh and He is our deliverer. In Matthew 8:16 of the Bible "When evening had come, they brought to Him many who were demon-possessed. And He cast out the spirits with a word and healed all who were sick"
Saints, when I went back to the doctor he told me my body was fine and my liver was functioning normally again, Bless God! That's what I am talking about - healing manifested in your body based on the Words of God. Saints, always remember God's best is that we never get sick (divine health). However, if it happens that we get attacked by the enemy, it is very nice to know that we have a God that will heal our bodies. So I thank my God and our Lord Jesus for providing healing in His redemptive plan of salvation for our lives. Saints, we serve a wonderful, mighty and loving God who hears our prayers (1 Peter 3:7) and is ever merciful. His mercies are new every morning and great is His faithfulness. In conclusion, the next time someone tries to tell you the reason you are sick is because God is putting it on you or trying to teach you something, remember to tell them where sickness comes from—the devil. Let them know that every good and perfect gift comes down from heaven—God. James 1:17 "Every good gift and every perfect gift is from above, and comes down from the Father of lights, with whom there is no variation or shadow of turning." 3 John 1:2 "Beloved, I pray that you may prosper in all things and be in health, just as your soul prospers." God bless you and stay healthy and blessed. 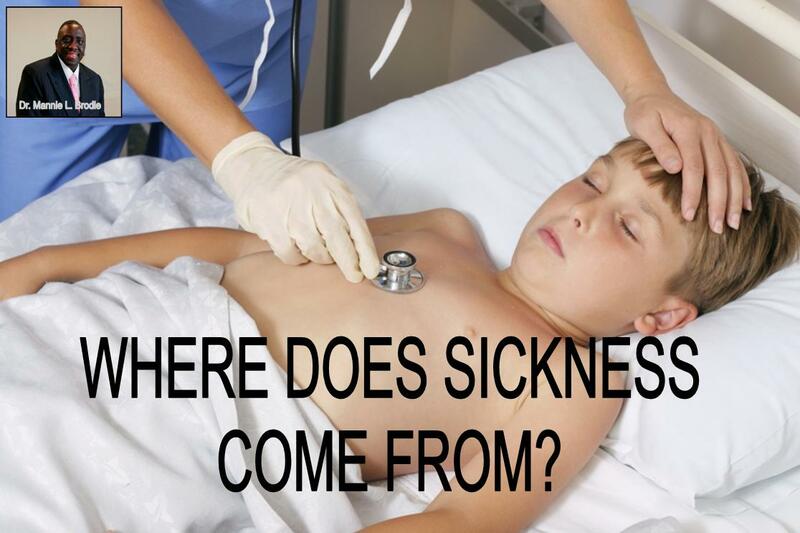 Thank you for answering the question, Where Does Sickness Come From! When my husband was diagnosed with cancer over four years ago so many well meaning Christians would say things like, If God Brings You To It He will Bring You Thru It...........Or, God won't put more on us than we can bear. Thank God I knew that sickness was not from God. I also was surrounded with great Christian friends who stood on God's Word with us. We believed, and spoke healing scriptures over my husband. He is HEALED of The Lord! I am sharing this blog on Facebook. Hoping it will help others understand that God's will is for us to be healed! God Bless You.